Carol of May Dreams Gardens hosts Garden Bloggers Bloom Day on the 15th of every month, giving gardeners around the world an opportunity to show what’s in bloom on their home ground. So let’s get to it! May has been a good month for color in my garden. 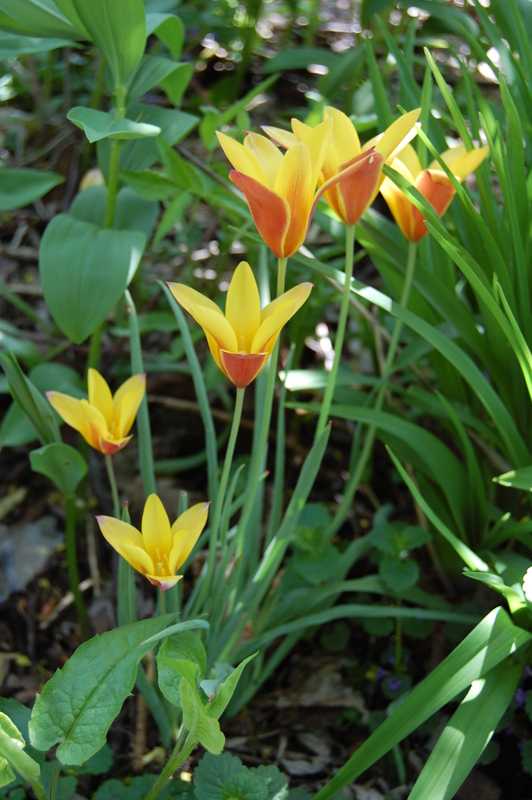 The lily flowering tulip ‘West Point’ is now blooming, adding its cheery yellow and elegant shape to ‘Flair’ and other varieties..
And Tulipa clusiana ‘Cynthia’, with petals colored red on the outside and a rich yellow on the inside. 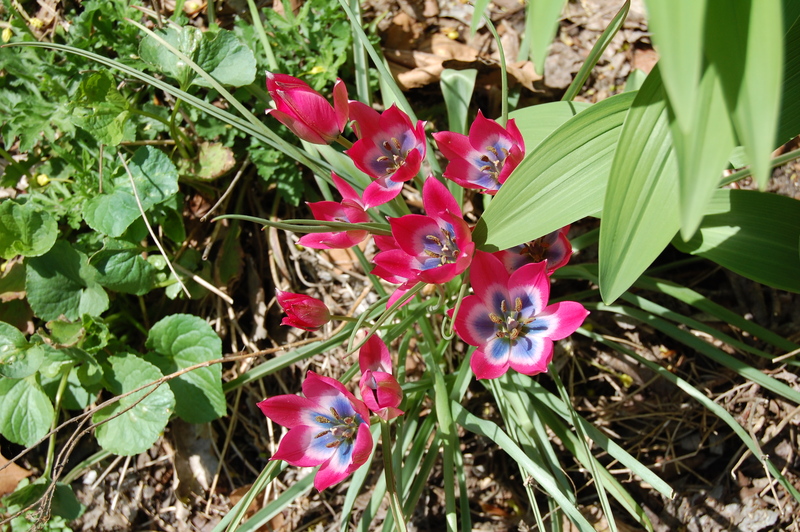 Tulipa orphanidea flava is a wonderful tulip, really interesting coloring. 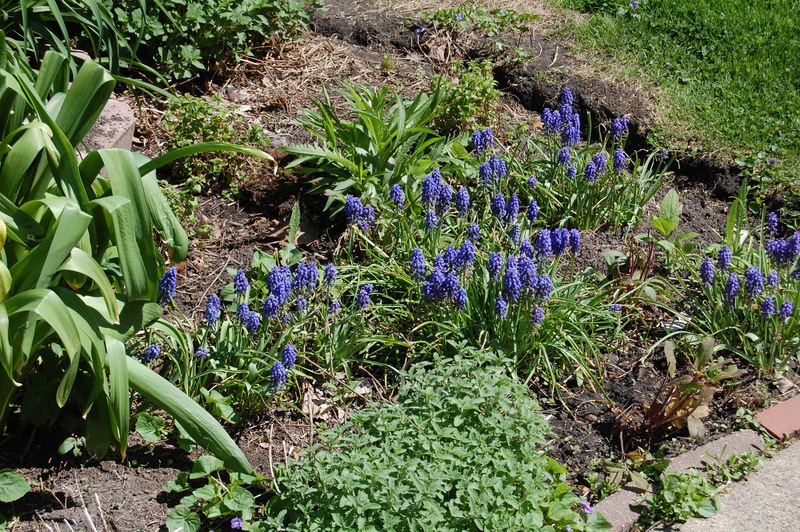 The grape hyacinths (Muscari armeniacum) are also blooming well. I can’t wait for these to spread more to create wider clumps, but the delay is partly my fault as I keep disturbing the beds to change perennials. 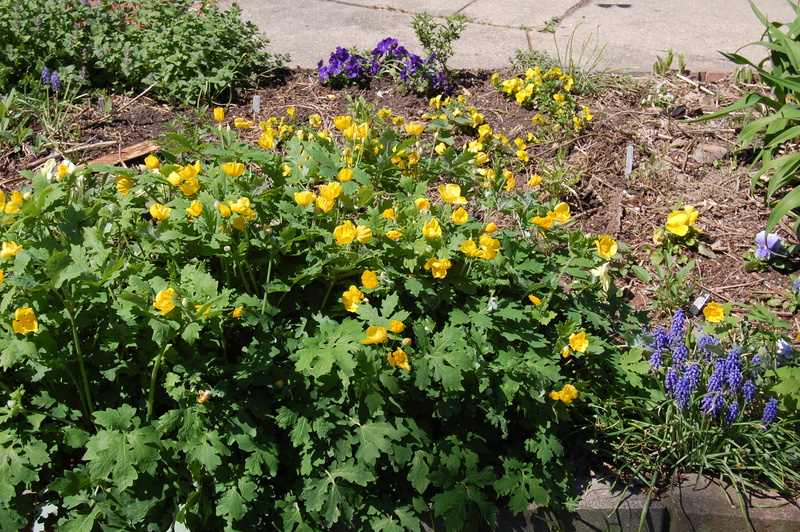 This has been an incredible spring for celandine poppies (Stylophorum diphyllum), the delicate yellow flowers blooming profusely over lush blue-green foliage. They are beginning to show more aggressive tendencies, though, I’m going to have to watch these guys more carefully. The clove currants (Ribes odoratum) in the sidewalk border are blooming. I planted these because they are supposed to have a strong fragrance. The fragrance is in fact very nice, but you have to put your nose right up to the flowers. This is their third spring, maybe when they are more mature … The much more modest Chartreuse flowers of wild currant (Ribes americanum) have also begun bloom. The tiny blue flowers on Nepeta “Kit Kat’ have just started to open. In my garden, the various Nepeta cultivars are essential plants for edging in areas that absorb hot afternoon sun. Nepeta ‘Kit Kat’ edging the raised front walk/driveway border. I thought the Virginia bluebells (Mertensia virginica) had reached their peak last weekend, but I was wrong. The cool weather has been kind. 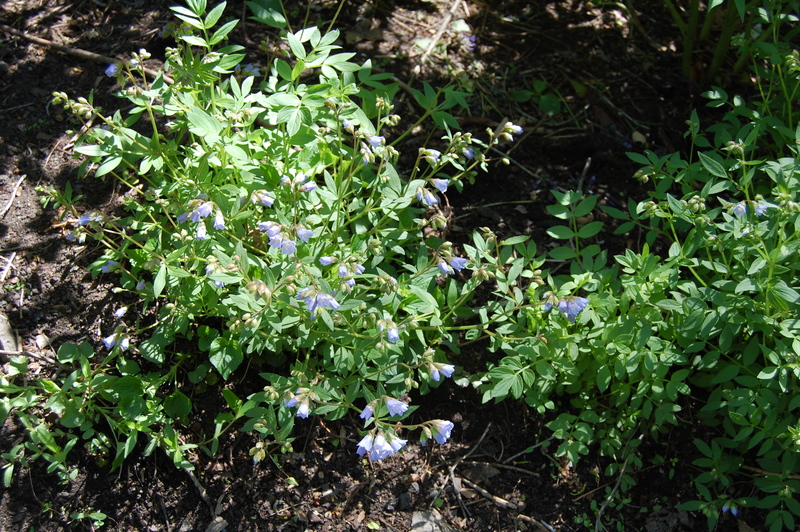 In the shady back garden, Jacob’s ladder (Polemonium reptans) works well as an edging plant. It also has blue flowers. False forget-me-not (Brunnera macrophylla) has tiny sky-blue flowers like real forget-me-nots, but this is a reliable perennial. Brunnera flowers poking up through Allium foliage. I devoted the last post entirely to old-fashioned bleeding hearts (Lamprocapnos spectabilis). Even so, I have to include one more picture for this post. 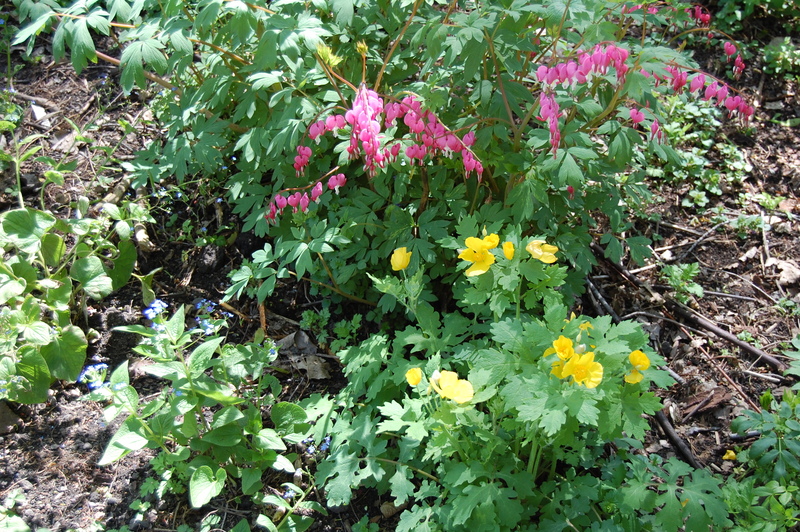 Bleeding Heart with Celandine Poppy. There are quite a few other flowers blooming now: annual stock, violas, and pansies; great merrybells (Uvularia grandiflora), starry solomon’s plume (Smilacina stellata), wild strawberry (Fragaria virginica), and probably a couple of others I can’t think of. Some of these I will include in my foliage follow-up. 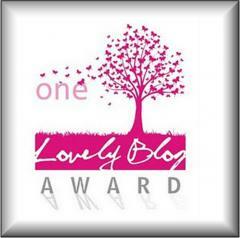 In the meantime, happy Garden Blogger Bloom Day to you all! The colors and shapes are gorgeous! I love how westpoint and flair look together. You must be in heaven now that you have so many things blooming so beautifully. I was just reading about clove currant. Thanks for the info. I was hoping for wafts of fragrance.. Thanks! The clove currant is also called buffalo currant, I think it grows in California . You have many lovely tulips. I have some white lilyflowered tulips, a very elegant form. Cynthia is also very nice with those colours. I bought a white bleeding heart, and I think there is a pink on the way that I planted last year. So beautiful. A white lily flowered tulip would look really nice. A lovely collection of blooms. 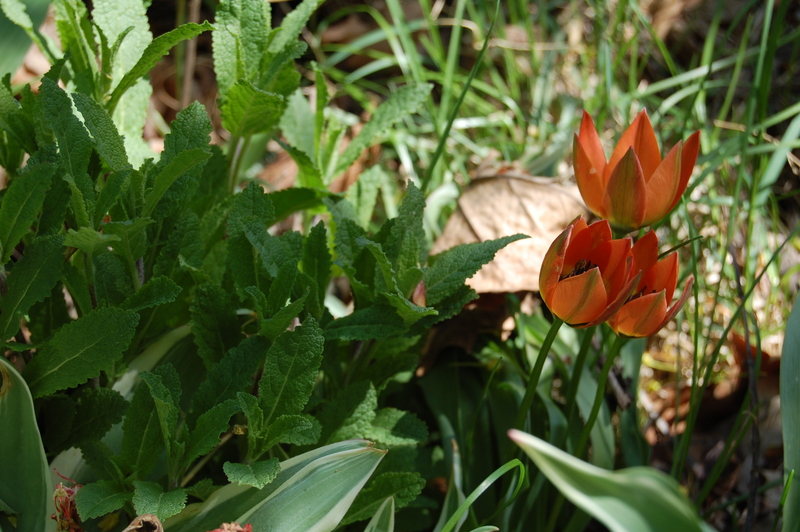 The tulips in pots really do look pretty – it was worthwhile taking care they didn’t freeze over winter! Yes I will definitely do it again, but with more pots! Such a lot of beautiful flowers making the garden look stunning. You must have soil that is the opposite to mine to be able to grow the plants you do so well. Your tulips make a super welcome to your house, I must try more in pots next year. Our soil is a loamy clay with lots of organic matter. It is pretty rich and plants tend to grow much larger than normal. Your garden has jumped to life! So beautiful. Nepeta is on of the sun-loving plants I miss most. ‘Kit Kat’ is too cute. Kit kat is a good low Nepeta, unlike Walker’s Low which is actually rather tall. Your tulips are wonderful!! Thanks for sharing them! It has been so warm here that I have to keep reminding myself that it’s still tulip time. You’ve got some beauties there. The weather was very cool here until the last week. Good for long-lasting tulip blooms. You have some beautiful tulip varieties and your second and fifth photos are gorgeous. And, don’t worry, one can never have too many photos of Bleeding Hearts as far as I’m concerned. Thank you! I think the second photograph is my favorite . Beautiful, I especially like those flowers with yellow and red combination. Absolutely beautiful! 🙂 I’m particularly fond of the airy blue flowers of the Brunnera – I keep forgetting that this is a perennial that I could grow here. I’ll have to try it…. You can definitely grow Brunnera, it comes from Siberia! You have quite a bit of orange/yellow in your garden. I always notice the blues, but the warm colors shine right now. I like those little flowers of Ribes. It is not a plant I ever grew. I like too how your entry is a ‘flower walk’. It is a very inviting entry and welcome. Thank you. 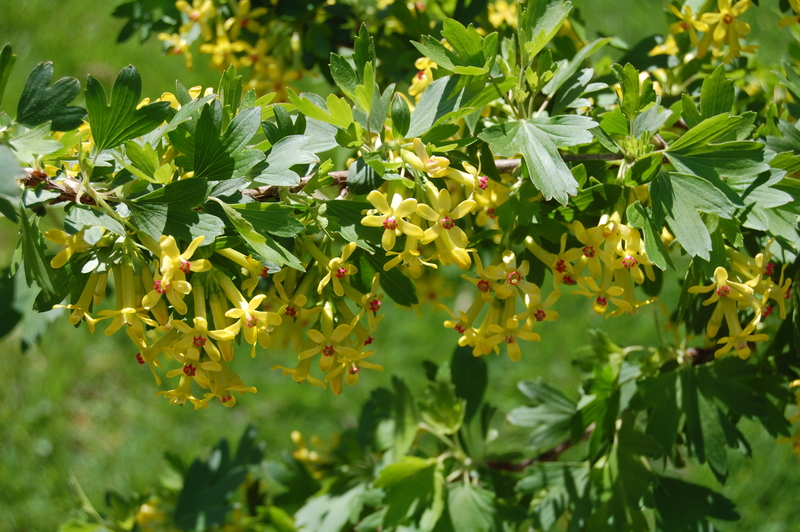 I grow two kinds of Ribes, the odoratum and R. americanum or wild currant. The wild currant is a very easy and adaptable shrub. The jury is still out on the odoratum. Jason, beautiful blooms in your garden! I love brunnera, I have one but it’s just small and doesn’t flower. The tulip ‘Flair’ is interesting, I love such shapes. 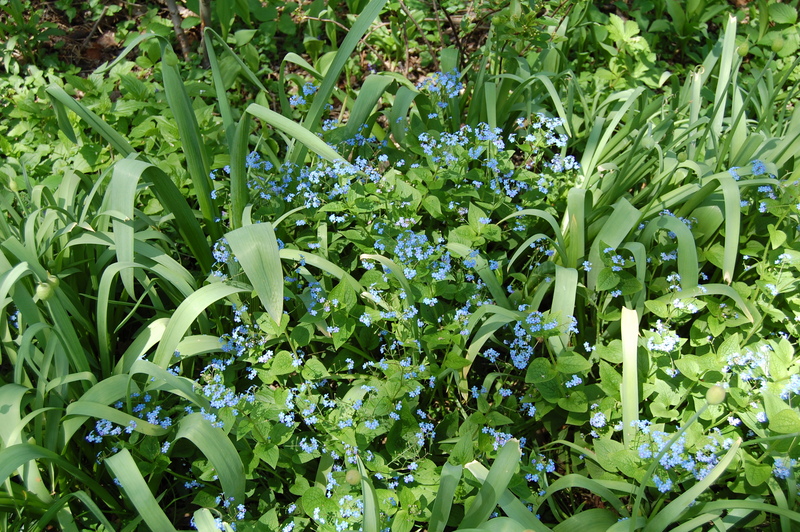 And I think Brunnera originated in Russia. 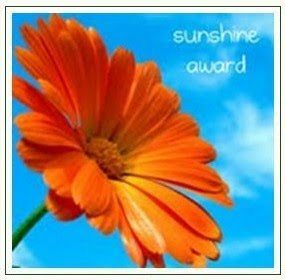 Your garden is looking lush and lovely! I really like all the species tulips you have. I planted some ‘Little Beauty’ last fall and am happy with it so far. Hope it likes its spot and returns for me. That ‘Cynthia’ is definitely going on my wish list! It has been a delightful spring, hasn’t it? I’m not familiar with the Clove Currant, but it looks like a wonderful addition to the garden–definitely visually, and if they have a pleasant scent, all the better! Happy GBBD! Happy GBBD to you! I’ve read that the fragrance is sweet but strong, which is fine with me. It is sweet but not so powerful, but maybe that will change with time. Love your potted tulips! As I’ve said before, you’ve inspired me to try it myself next year! The weather this spring has been good for bloom longevity. Here we’ve had plenty of sunny, cool days, with a few rainy days mixed in here and there. Nothing too hot yet. Very nice for working outside without working up a sweat or worrying that your new transplants are going to wilt from the heat! So many people are featuring nepeta this month. I’m sorely tempted, but I fear someone else, namely my cats, would find it sorely tempting as well! Still, I may try it and see what happens! Same to you. There are several outdoor cats in the area, I don’t think they have been too much of a problem with the nepeta. You could try calamine as an alternative. I admire your great pictures. I remember the pots. It flourished in these wonderful tulips. I love plants in yellow. They are such a joy. I know they’re a bit thuggish but I love those celandine poppies. I’m falling more and more in love with species tulips. I have both early and late ones. I loved yours – another type of plant I am thinking of getting more of. Tulips don’t do as well here in the Binghamton, NY area as daffodils do but the species tulips seem to do better than the fancier tulips. 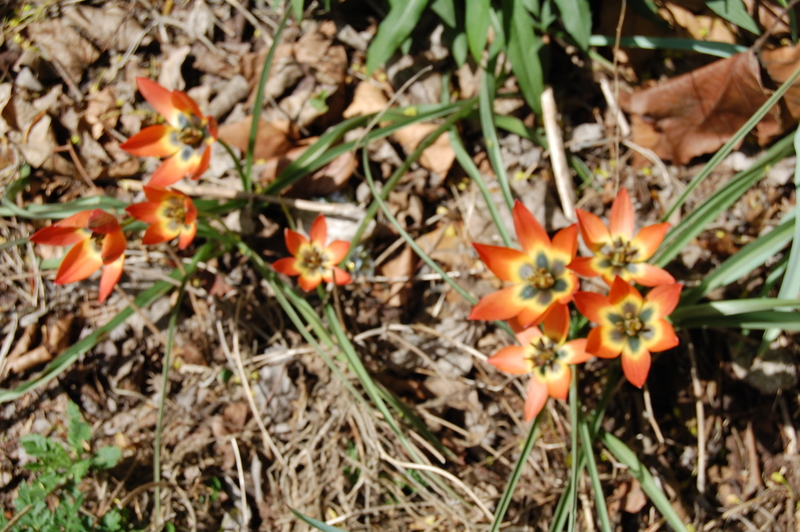 The species tulips are definitely tougher than the hybrids. Love the tulips. The pots of tulips are very nice, colorful, and cheery. They were worth all the worrying over! 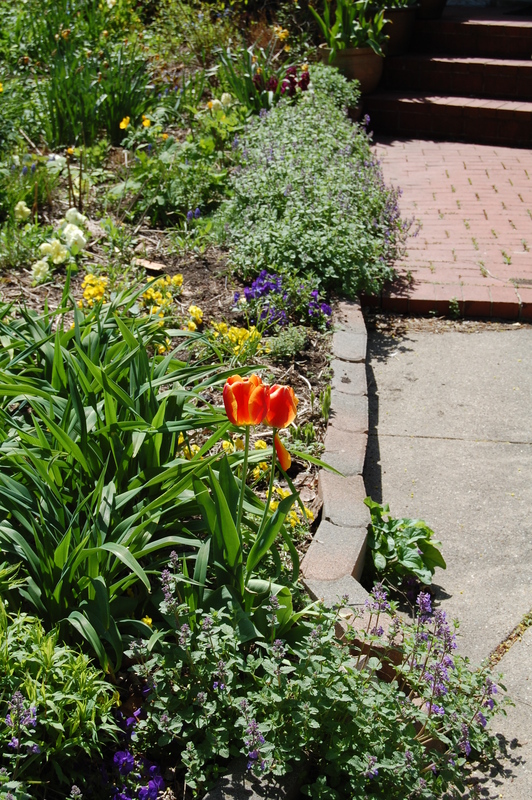 I love your tulips…so many varieties and so gorgeous. Mine have completed their spring display, but I enjoyed seeing yours. 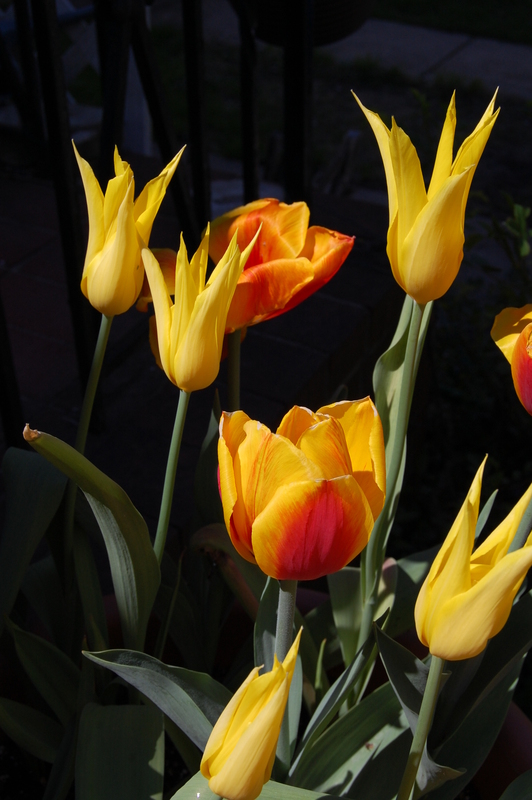 I can only echo your other commenters – love those tulips! I do envy anyone who is able to grow them. I have no luck at all with them. On the other hand,you have so many things that grow beautifully for you that cannot be grown here. Lovely tulips, you have a very nice collection there, All my tulips are rather early and they have all finished, all I am left with is the dying leaves. I liked your Virginia Bluebells, haven’t seen them before, I know English, Spanish and Scottish bluebells, but Virginia Bluebells was new to me, Nice! 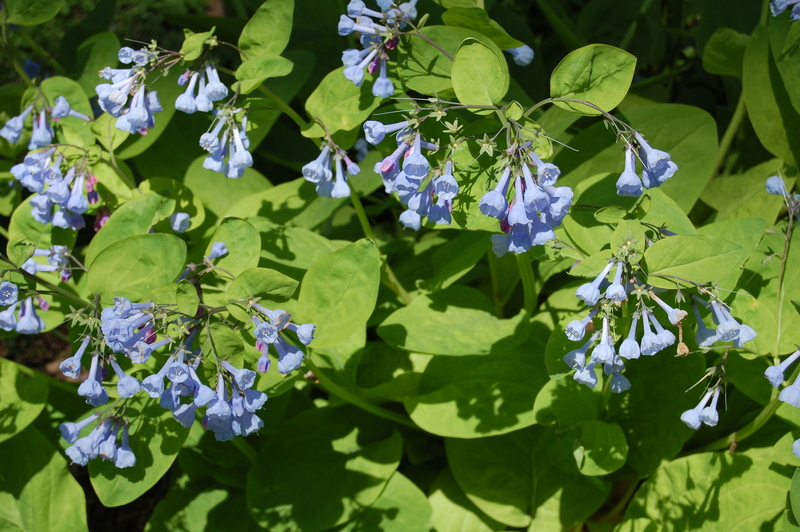 Problem with Virginia bluebells is the foliage gets ratty and floppy after blooming. I have never heard of these clove currants. They are quite pretty. 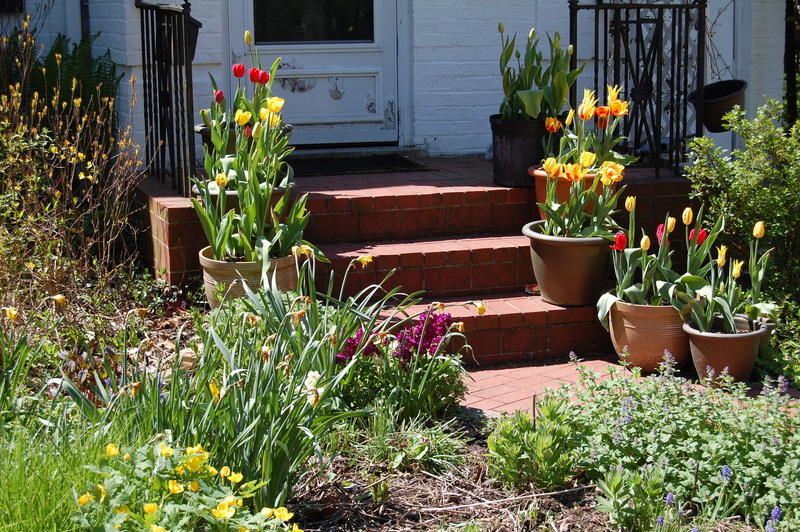 Your plethora of tulips sure jazz up the entrance to your home with welcoming color.Happy GBBD. I never considered growing tulips in pots but it certainly makes sense. What a welcoming entry! One of the reasons I haven’t planted many bulbs lately is, like you, I keep disturbing the beds to change things around. Happy GBBD! Wow! I really envy your garden Jason. Those blooms are really lovely.Lovely! Lovely Jason, those tulips in pots really brighten up the steps. Plenty, plenty colour Jason – your tulips are amazing!! It all looks very sunny over there. We are quite a way off that summer look in the garden yet over here. I came across that Ribes odoratum for the first time the other week. I really like it and it’s one I’ve added to my ever extending wish list. A symphony of color! Gorgeous! So much colour in your garden! My tulips have only just opened. Loved that Ribes, I’ve never heard of that one before but I have a love of all currants. Everything looks so perfectly “Spring-y”! Love the Bluebells, in particular, but I’m a sucker for anything blue!